How does the economic context within a country affect support for the European Union? John Garry and James Tilley present results of a study on the way in which the views of right-wing and left-wing citizens are shaped by the economic context within EU states. The findings show that those with right-wing opinions tend to have lower support for European integration if they already live in a broadly right-wing country; however right-wing citizens in left-wing countries are more supportive of the EU. This offers one explanation for why cooperation between political parties across Europe has proven difficult: even when parties share the same ideological principles, they may have varied views on future integration depending on the economic conditions within their own country. Whether or not you like the EU depends on your answers to these two questions: Are you left or right wing? And do you live in a left or right wing country? The simple logic at play here is that, at least for some people, there is a link between what kind of society they would like to live in (a social democratic or capitalist one) and the kind of society they think a fully integrated EU would lead to. Imagine I’m in favour of economic equality and I like the idea of the state providing lots of services – in other words I’m a fairly standard social democrat. Further imagine that I live in a social democratic type of place like Denmark. When I’m faced with the question of greater EU integration I should start to get a little anxious. A fully integrated EU would likely have a single set of taxes and benefits universally implemented across EU member states. This system would likely be to the right of current Danish economic policy. Hence my anxiety and likely rejection of EU integration. Imagine on the other hand somebody with exactly the same social democratic views as me, but who happens to live in a fairly right wing economic context such as the UK. For such a person EU integration might be positively welcome as an integrated EU wide economic policy would very likely be to the left of the current UK regime. We used survey data from 27 different EU member states to test this line of thinking and, as the figure below confirms, context does matter. The figure shows how views on the EU change as you move from having a left wing position to a right wing position on core economic issues. 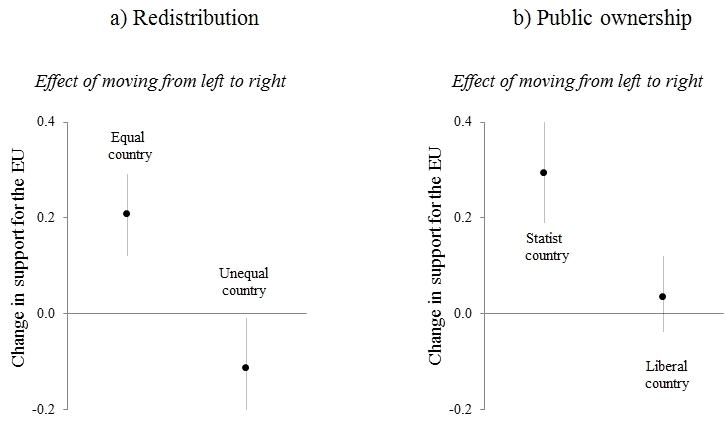 Being rightist on the issue of wealth redistribution is associated with being pro-EU in an economically equal country but being anti-EU in an economically unequal country. Similarly, on the issue of public ownership, we see that right wing views are associated with being strongly supportive of the EU in a statist country, but not so in a liberal regime. Note: These figures show the predicted changes in support for the EU for a) someone that moves from a leftist position on redistribution to a rightist position on redistribution in a country with a relatively equal income distribution (Gini score of 0.23) and a similar change for someone in a country with a relatively unequal income distribution (Gini score of 0.38), and b) someone that moves from a leftist position on public ownership to a rightist position on public ownership in a country with relatively high state employment (18 per cent of GDP expended on government wages) and a similar change for someone in a country with low state employment (7 per cent of GDP given over to government wages). We are not suggesting by any means that economic context is the only thing that matters. However, when trying to make sense of how and why citizens across Europe differ in their support of the EU, it is useful to highlight that where they live is important. It matters because further economic integration has differential effects on the status quo of people living in different countries. If the status quo is income equality and public ownership, then integration will likely mean a policy shift to the right. If the status quo is income inequality and private ownership, then integration will mean a policy shift to the left. This helps us to understand why cooperation between political parties across Europe is difficult. A group of parties may share exactly the same left wing views, but that doesn’t mean that they all share support for EU integration. Such integration would mean accepting a more right wing policy settlement in their own country for at least some of these parties. And of course, the same logic applies for mainstream parties of the right. This represents a challenge for the development of a coherent party-based EU-wide democracy, and perhaps helps explain why it is competition between domestic political parties, rather than EU party families, that continues to dominate EU-wide elections to the European Parliament. Note: For more details on the authors’ research see their recent journal article in European Union Politics. This article gives the views of the authors, and not the position of Democratic Audit or the LSE. It originally appeared on LSE EUROPP – European Politics and Policy. Please read our comments policy before commenting. John Garry is a senior lecturer in comparative political science at the School of Politics, International Studies and Philosophy, Queens’ University Belfast. He focuses on citizens’ EU attitudes and political behaviour. James Tilley is a university lecturer at the Department of Politics and International Relations, University of Oxford and fellow of Jesus College, Oxford. He works primarily in the fields of public opinion and electoral behaviour.